Sunshine Preschool and Circle of Friends Preschool* send graduates to Brentwood, John Thomas Dye, The Center For Early Education,Curtis School and Carlthorp, which in turn, send their graduates to Harvard-Westlake and Marlborough, which then send their graduates to Harvard College, Yale, Princeton and Stanford (and the other Ivy League Schools). Obviously, these are not the only ways for a child to get into Harvard-Westlake or Marlborough. But, it’s a common path, familiar to the well-connected and well-to-do families on the Westside of LA. From the schools’ perspective, according to our source at Harvard-Westlake, it’s about test scores, ensuring that the kids who follow the “feeder” school paths will hit the test scores the schools desire at every level. Note: Crossroads, Oakwood, Brentwood, Campbell Hall and Wildwood are K-12 schools so naturally their own students continue from their lower schools through secondary school. 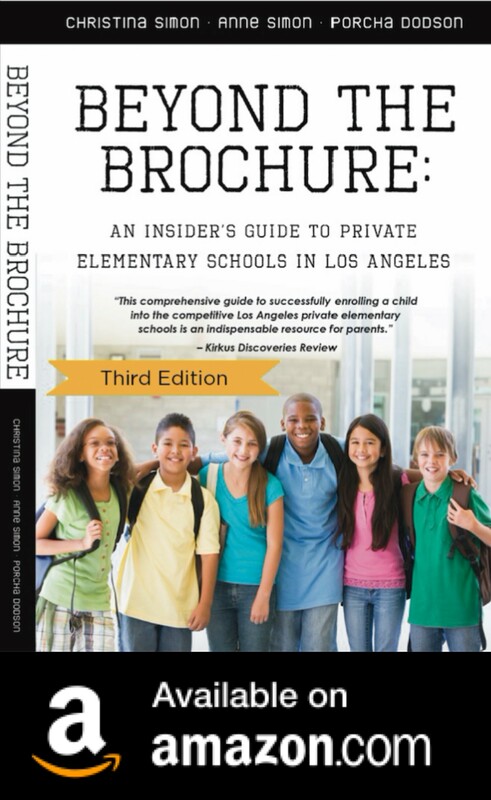 We discuss the issue of “feeder” schools in more detail in Beyond The Brochure. Great news! Your new private elementary school has a summer camp. To enroll or not to enroll? That’s the question. After preschool ended and I was trying to decide what my daughter would do during the summer before kindergarten, I contemplated enrolling her in the Willows School’s Summer Camp (called Iverbe). Several private elementary schools have summer camps so this is something you may be considering. There would be benefits, for sure. There were also drawbacks. My daughter, as I’ve mentioned before, was shy and needed time to get to know new places and people. I worried about her “jumping right in” to a boisterous summer camp, filled with kids she didn’t know. Maybe “worried” was an understatement. 2. Things could go so badly we’d have to pull her out of camp and therefore make a terrible impression on the “powers that be” at the school. My mind kept going. They’d retract my daughter’s offer, deciding she wasn’t ready for kindergarten. She’d had her chance and it hadn’t worked out. “Find another school”, they’d say. Of course, this doesn’t happen in real life! If the camp experience isn’t right, that really has no relationship to the school experience. 3. Too much stress. Why not just enroll her someplace we already know she’ll do just fine? So, what did we do? We opted to skip the Willows Summer Camp before my daughter started kindergarten. When I’ve talked to other parents about this issue, it’s a mixed response. Some parents enroll their kids in the summer camp of their new school and their kids love it. Others enroll their kids at the camp for a short time i.e. a week or two to test the waters. Sometimes, things go badly and they go for a few days and leave. It really depends on the type of child you have. After kindergarten, my daughter (and my son) have attended the school’s summer camp every year and they love it. I write this because it was something on my mind the summer before kindergarten maybe its something you’re thinking about too. Marlborough School has 100 feeder schools: “As you can imagine, having good relationships with our feeder school principals is essential to our success in promoting Marlborough School’s reputation throughout the Los Angeles community,” Director of Admissions Jeanette Woo Chitjian said. Although the student body comes from roughly a hundred feeder schools, the Admissions Office would like to increase that number, Woo Chitjian said. (source: Marlborough School New Ultraviolet Newletter, 2009). – One top Westside preschool director is so concerned that parents at her preschool are only applying to the same very difficult-to-get-into three schools (John Thomas Dye, Brentwood, Carlthorp) and not getting in, that she has begun inviting other schools to visit her preschool in an effort to encourage parents to apply to a broader range of private elementary schools. – Marcia Capparela, Asst. Head of School at Wildwood and longtime friend of Beyond The Brochure Co-Author, Anne Simon, will be leaving her position to join Westland School on Mulholland. Good luck in your new position, Marcia! Willows School Volunteer Options For New Parents-What Would You Choose? Here is the list of The Willows School volunteer activities any parent can sign up for. As you can see, there’s lots to do at my kids school and at most private elementary schools. This isn’t even all of the volunteer positions that need to be filled (committee co-chairs, room parent and other leadership positions are generally offered to parents who have volunteered in one or more of the positions below first). Hint: When you are writing your applications, look at the school’s events and volunteer activities to see if your skills or interests match their needs. If so, mention it in your application!! I’ve worked on the Book Fair, Co-Chaired the Auction, Served as class captain for the annual giving campaign and more. Everything I’ve done has been based on my interests and skills. 3. AUCTION ITEM SOLICITATION: Join the team in procuring fabulous auction items and sponsorships. 4. AUCTION ITEM MANAGEMENT: Database input and management of auction items. 5. BOOK FAIR: Help plan and organize the Fall Book Fair Celebration. 6. CULTURAL PROGRAMS: Help committee to promote a greater understanding of the history and diversity of cultures and people. 8. HOT LUNCH: Assist the Hot Lunch program Co-Chairs. Act as a “lead” hot lunch server. “Lead” servers are asked to commit to overseeing the serving of hot lunch one day, every other week throughout the school year. (Hours are from 11:30 am –1 pm). 10. LOST & FOUND: Help keep lost and found organized. Sort and deliver items with names to classrooms. Volunteers are asked to commit approximately one hour every other week. 11. PACIFIC PARK PIER EVENT: Help plan and organize the spring family event. 12. POSTER/SIGNAGE COMMITTEE (A): Looking for Graphic Designers to create posters/signage and invitations for school events. Knowledge of Photoshop and other design programs required. 13. POSTER/SIGNAGE COMMITTEE (B): If you are not a graphic designer, you can volunteers to print posters/signage on our large format printer, and then mount for use at school and special events. We will train on printer. Some knowledge of Photoshop required. 14. SCHOOL PHOTO COORDINATION: Work with co-chair to coordinate activities between photographer, yearbook staff, teachers, administration and parents. Coordinate scheduling for portraits, all school photo and class photos. Organize parent volunteers for photo shoots. 15. T-Shirt Sales. Assist in the organization, sales and delivery of Willows T-shirts, both regular and event (Book Fair and Pier Party) throughout the year. 16. VIDEOGRAPHY: Video various school activities and daytime/evening events as coordinated by Willows staff. Supply Communication/Media with footage we will share on our website and use in school video productions. Responsible for downloading footage to our Willows Yearbook server. Willows will supply a digital camcorder that can be checked out for use at the school. Download is easy with a DV memory card. It’s important to have some computer knowledge for downloading to a Macintosh. 17. YEARBOOK: Assist in the planning, assembly and production of the annual Willows yearbook.